​Airborne is so pleased to announce that we have moved to a new bigger, brighter, and better facility. We now have almost twice as much space to provide our athletes with even more terrific trampoline and tumbling programs. New Location - Warner Business Park in the South end of Okotoks down the road from Hitz Batting Cages. The major intersection is Highway 2 & Highway 7 (see map to the right). Travel South to highway 7. Travel on Highway 7 East towards Highway 2. At the lights by the Petro Canada turn left towards the Volker Stevin plant. Follow 393 Avenue East for about 1 minute to our new location. 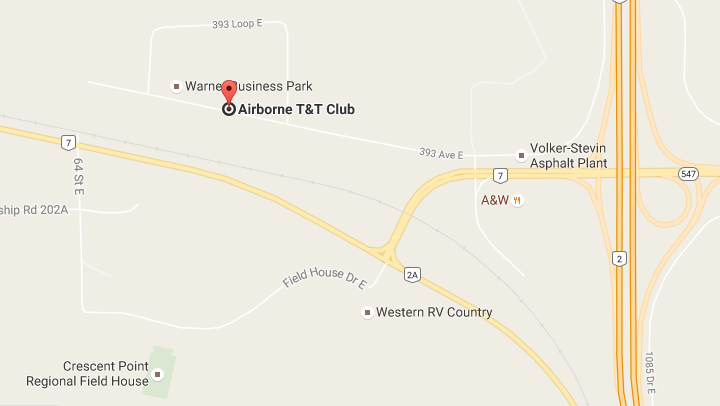 From AB-2 South take Exit 209 / 7W into Okotoks (Petro Canada & A&W are on the corner). At the lights turn towards the Volker Stevin Asphalt Plant and follow 393 Avenue East for about 1 minute to Airborne's new location. ​Phone: 587-3176910 - Please note, phones are not answered over the weekend, it may take a day or two during the week to return messages. If you need a quicker response please email at airbornettoperations@gmail.com.